The Fédération Cynologique Internationale (FCI) is more than one hundred years old; it was actually formed in 1911 and this year celebrates its 103rd anniversary. It now has 89 member countries. Reconciling the different points of view and finding solutions that satisfy everyone (or at least the majority) is never easy. Each member has its own structures, traditions or reality, whether economic, social or cynological. There is, however, one area where the desire to move forward together and keep pace with the challenges of our time is undoubted; that area is the modernisation and simplification of working procedures. Mr Rafael de Santiago was recently invited to attend the China Kennel Union-FCI International Dog Show in Shanghai, China on March 13, 14, 15 & 16, 2014. During his visit to Shanghai, Mr de Santiago was able to assess the constant growth of the FCI activities in China. “Since the beginning of the relation between the FCI and the China Kennel Union, the CKU has done an excellent job regarding the development of the canine sport in this wonderful country”, said Mr de Santiago about the growth of the CKU and the FCI in China. “The passion of the Chinese people for the FCI is notable, we should be honoured for that”, also mentioned de Santiago after expressing his gratitude to the CKU for their welcoming hospitality. Mr de Santiago also took the opportunity to hold a very productive and positive meeting with the CKU Board of Directors to discuss the evolution and the future of the canine sports and the FCI in China. From left to right: Mr Hongwei Luo (CKU Vice General-Secretary), Mr Roberto Vélez-Picó (officiating judge at the Show), Ms Qing Li (CKU Executive President) Mr Rafael de Santiago (President of the FCI), Mr Dianqi Xie (CKU General-Secretary) Mr Tao Gong (Director of CKU International Department). The Egyptian Kennel Federation for Breeds Purification (EKF), whose president is Mr Mohamed El Azhary. Egypt is thus joining the big FCI family now counting 90 members. Welcome to our new contract partner! 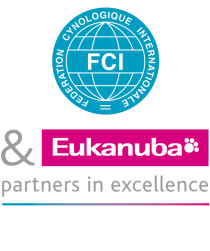 Visit the FCI stand at a selection of dog shows in 2014 ! Subscribe to the printed version of the FCI newsletter!